SCVHistory.com | Mojave Desert | Linda Castro: Trona Pinnacles, 2017. SCVNews.com | Thursday, January 19, 2017. More than 2 million people visit Joshua Tree National Park and Death Valley National Park each year. While there are many beautiful and interesting places to visit in each of those parks, there are many desert treasures that can be found outside of those national parks. One is the Trona Pinnacles, located about 28 miles east of Ridgecrest in the Mojave Desert. 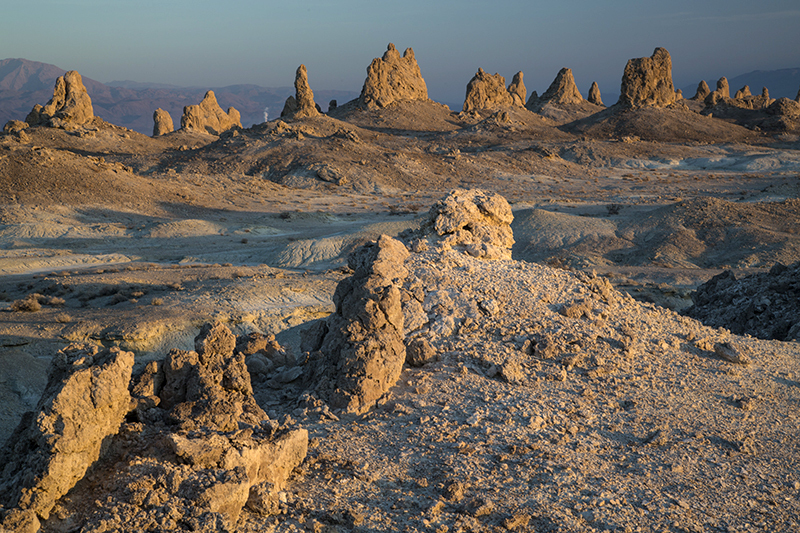 When you visit Trona Pinnacles, you cannot help but feel like you are on the moon or on another planet. Trona Pinnacles are some of the most unique geological features in California's desert. The unusual landscape is made up of more than 500 spires, some as high as 140 feet, rising from the bed of the Searles Dry Lake basin. The pinnacles vary in size and shape from short and wide to tall and thin, and are composed primarily of calcium carbonate (tufa) like those found in Mono Lake. The pinnacles were formed underwater from 10,000 to 100,000 years ago when Searles Lake was one of a chain of interconnected Pleistocene lakes stretching from Mono Lake to Death Valley. Cones are less than 10 feet tall and are dumpy and mounded cone shapes that lay scattered throughout the Trona Pinnacles. In 2016, the BLM designated Trona Pinnacles as part of the California Desert National Conservation Lands due to the area's nationally significant scientific and ecological values. This means the area will be managed to protect those values and will be permanently protected from development. Prior to that, the BLM designated the area a National Natural Landmark in 1968 and an Area of Critical Environmental Concern in 2013, due to the area's geologic importance. But neither of those prior designations provided the area with permanent protection from development. 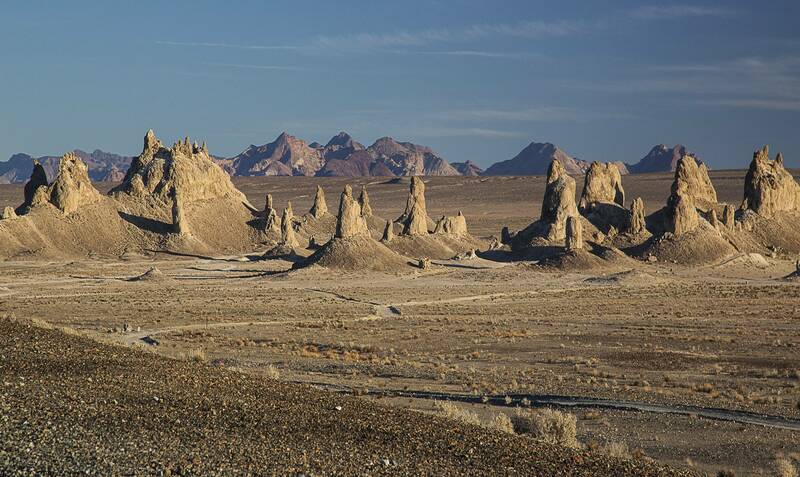 Trona Pinnacles have been featured in many commercials, films and television shows such as "Battlestar Galactica," "Star Trek V: The Final Frontier," "Lost in Space" and "Planet of the Apes." A short, half-mile hiking trail leads from the parking area into the middle of the pinnacles, giving visitors a close-up view of the pinnacles and the surrounding desert. Although the hiking trail is short, it is easy to spend hours looking at and exploring the pinnacles. The best times of day to visit are sunrise and sunset when the pinnacles can look like they are glowing. It is well worth the trip. 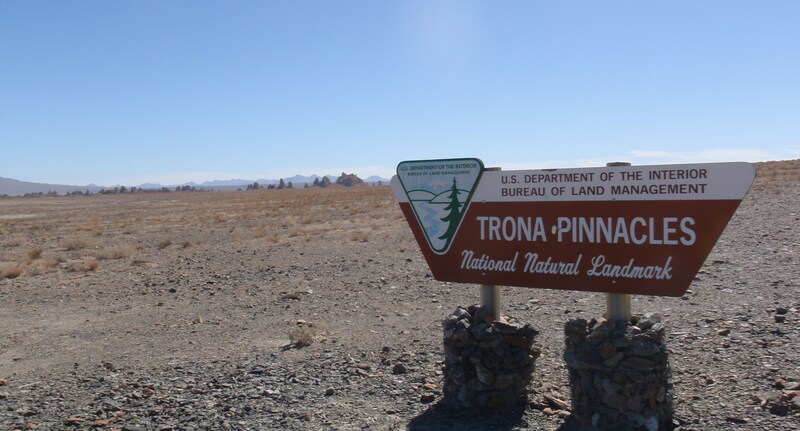 Trona Pinnacles is about a 2½-hour drive from the Santa Clarita area. You can get there by traveling on Highway 14 north and taking the exit for Highway 178 to Inyokern and Ridgecrest. Continue traveling about 28 miles east on Highway 178 (passing the intersection with Trona-Red Mountain Road) and turn south (right) onto BLM Route RM143. You will see a BLM sign for Trona Pinnacles where you turn off of Highway 178. Travel the dirt-gravel road for about 5 miles to the site. You can visit Trona Pinnacles for free. It is open year-round, but due to the extreme heat in the late spring and summer months (110-plus degrees), the best times to visit are in the fall, winter and early spring. Visitors should wear hiking boots or good walking shoes. The dirt-gravel road is generally accessible to passenger vehicles (if you are willing to drive on washboard conditions for 5 miles), but after a rain, the road may be impassable, even for four-wheel drive vehicles.